I probably eat this for lunch more than anything else. I mean, it’s basically your favorite juicy burger topped with a slice of cheddar cheese & 2 slices of bacon, which is always a crowd favorite. If you're ever at a cookout, this is how to have your burger and stay on track with your keto diet. 2 Cups of romaine lettuce roughly chopped. Heat a skillet over medium heat on the stovetop & cook the bacon until crisp. Remove from pan. Cook burger in the bacon fat until done to your preference. Turn off the burner. Add cheddar cheese and cover the pan so the cheese melts - about 1-2 minutes. Place lettuce in a wide shallow bowl. 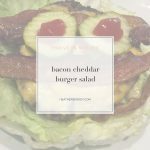 Add burger on top of lettuce and place or crumble bacon slices over top of your salad. The nutrition information listed is for a ground chuck burger, 1 slice of cheese, and 2 slices of bacon on a head of green bibb lettuce. Adjust your macros if you add anything else.